Address: Els Arinsols, 10, Encamp, Andorra. Hotel Guillem is located in the Andorran village of Encamp, 5 minutes’ walk from the Grandvalira ski lifts. It offers an extensive spa and rooms with free Wi-Fi and private balcony. All rooms at the Guillem feature parquet floors. They are equipped with satellite TV and the private bathrooms come with a hairdryer. There is also a bar where you can get a snack or a drink. 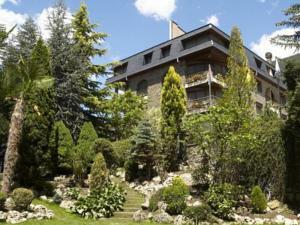 The Guillem has a fitness centre, and the spa features a hot tub, sauna and swimming pool. The Guillem Hotel is a 10-minute walk from Sant Romà de les Bons Church. Les Escaldes Shopping Centre is 4 km away.